My Dad died 5 years ago today--he's still dead, which probably doesn't surprise you. Everybody's Dad is, at some point, bigger than life, of course, and the obituary tells tales of when men were men and giants still roamed the Earth. I'd been disowned by Bill Doyle twice (the second time lost its luster when I reminded him there was a first time), but few men were more generous. Dad was born in Pittsburgh, the only child of parents who had emigrated from Ireland via Bolton. My grandfather started off here as a garbageman, and eventually managed an A&P. My grandmother made her tea every afternoon, no matter which war was being waged at the time. They were poor. They moved a lot. My Dad was also extraordinarily short until late adolescence. Dad compensated with toughness. Dad spent an evening with the Hells Angels MC in New York City. In their club. Dad flew A4 Skyhawks off aircraft carriers; while showing off after maneuvers, he clipped a tree and lived to tell about it. Dad gave his sons a lesson on how to break a bottle to use as a weapon. We were 9 and 10 at the time. Dad broke his neck diving, and survived. He had friends, lots of them--one of them was an FAA certified physician. Dad flew a lot of passengers with a gimpy arm TWA never knew about. Dad left a lot of skin on the pavement. He loved motorcycles; he loved flying even more. My guess is that his happiest moments were when he was airborne 2 feet over the pavement at 110 mph, having (again) separated himself from his bike at high speed. Oh, he managed to get an engineering degree from Villanova along the way (and never used it) as well as a law degree from Seton Hall, (which he barely used, though he did work for Roy Cohn a bit). He wasn't a great student, he was bright enough that he didn't need to be. Last thing he wanted to do was to work in a box somewhere. He loved the internet, and he could figure out to fix just about anything. His forte was critical thinking (and fun), not degrees and credentials. I'm not saying credentials do not matter. I'm just saying some things matter more. 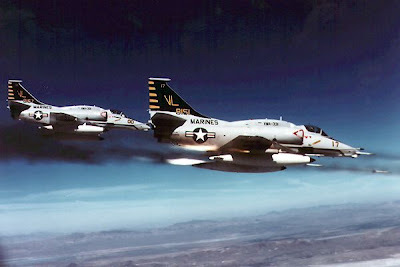 A4 Skyhawk photo lifted from Boeing, which grants noncommercial, personal use. Ah, Pittsburgh Diaspora. Makes sense. I know how you feel. My heart aches for both of my parents. I think about them every day. They are a part of me. Dad's are special. They're different. Trollies, back alleyways, and bricks. I think the trips through Noah's Ark at Kennywood warped me a bit. I loved the town, the grittiness (everything was black from the coal), and, of course, my grandparents. Thanks for the words. I debated posting this one, and now I'm glad that I did. I'm glad you posted it too. Your dad had quite a story! A month after I met Michael, his dad took his sons (18 and 17?) up to Vermont for a weekend of motorcycling, possibly drinking, and according to some witnesses, inadvertent stealing of a police car. Michael came back with his leather jacket in tatters from some offroad bike "incident." And sounding like he'd had a great time. Good thing he had the jacket on, or it woulda been his hide in tatters. Bill Doyle was just as cool as Michael shows him to be here. I was very fortunate to have a second chance at a dad after losing mine early. The off-road incident was hitting a jump then realizing in mid-air that Vermont has rivers during mud season that aren't usually there. Engine sucked air, died, I couldn't gt it out of gear, and half-carried the bike home. What a fabulous tribute to your Dad.